Limelight Marketplace, at 656 Avenue of the Americas, opened on May 7, 2010 in the former Church of the Holy Communion, which gained notoreity in the 1980's as a nightclub. Conceived by Jack Menashe, the 20,000-square foot, three-story retail emporium consists of more than 60 small, high-end shops and food vendors. Menashe hired Henri Bendel designer James Mansour to design the marketplace and restore historically significant interior details, including stained glass windows not seen since the church's deconsecration. The Church of the Holy Communion, was originally built from 1844-46 by Richard Upjohn. In 1850, Upjohn added a rectory and parish house, and then in 1853, the Sisters' House. Designed to resemble a small medieval English parish church, its was highly influential as the first asymmetrical rustic Gothic Revival edifice in the United States, becoming a prototype for later churches throughout the country. the Holy Communion into a disco and rock club. In the 1990's, it became a prominent techno, goth and industrial scene and gained notoreity as a place to obtain recreational drugs. In 1996, promoter Michael Alig was arrested and later convicted for killing Angel Melendez, a Limelight-based drug dealer, a story fictionalized in the 2003 film, Party Monster. The Ladies Mile Historic District, an irregular district defined roughly from 18th Street to 24th Street and Park Avenue South to Avenue of the Americas, preserves 440 buildings on 28 blocks. Between the Civil War and World War I, the district was the location of some of New York's most famous department stores, including Lord & Taylor, B. Altman, W. & J. Sloane, Arnold Constable, Best & Co., and Bergdorf Goodman. Also included is Daniel H. Burnham's Flatiron Building, at Fifth Avenue and 23rd Street; most of the Ladies' Mile Historic District lies within the Manhattan neighborhood named after that building, the Flatiron District. 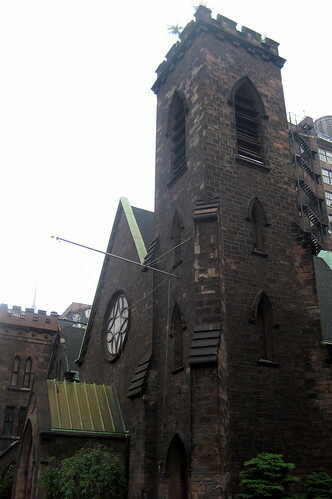 The Church of the Holy Communion (Episcopal) Complex was designated a landmark by the New York City Landmarks Preservation Commission in 1966. The Ladies Mile Historic District was designated a historic district by the New York City Landmarks Preservation Commission in 1989.